, an eminent optician, was born at Worplesdon, in Surrey, in 1704, and began life as a plough-boy at Broad-street, a hamlet belonging to that parish. By some means, however, he contrived to learn reading, writing, and arithmetic, so as to be soon enabled to teach them to others. For some time he continued to assist in the farming business, but, as our authority states, “finding that he became a poor husbandman in proportion as he grew a learned one, he prudently forsook what indeed he had no great inclination for,” and having a strong inclination to mathematics and philosophical speculations, now entered upon such a course of reading and study as in | some measure supplied the want of a learned education. The historian of Surrey says that he first taught reading and writing at Guildford. 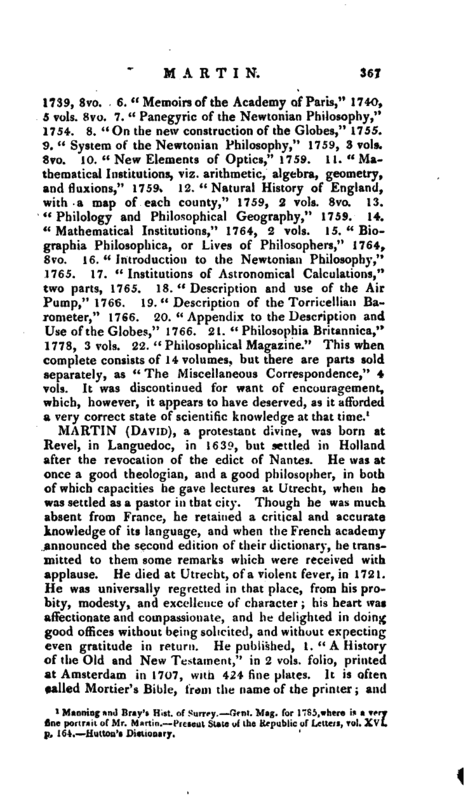 It was probably some time after this that a legacy of five hundred pounds bequeathed to him by a relation encouraged his laudable ambition, and after purchasing books, instruments, &c. and acquiring some knowledge of the languages, we find him, in 1735, settled at Chichester, where he taught mathematics, and performed courses of experimental philosophy. At this time he published his first work, “The Philosophical Grammar; being a view of the present state of experimental physiology, or naturaf philosophy, &c.” London, 8vo. 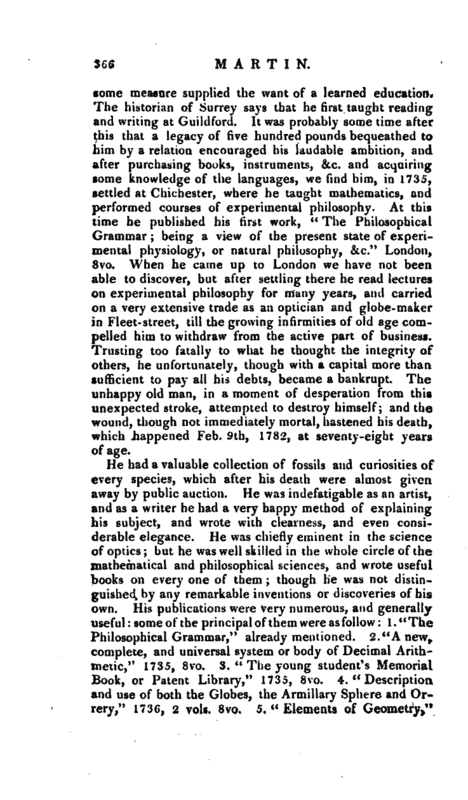 When he came up to London we have not been able to discover, but after settling there he read lectures on experimental philosophy for many years, and carried on a very extensive trade as an optician and globe-maker in Fleet-street, till the growing infirmities of old age compelled him to withdraw from the active part of business. Trusting too fatally to what he thought the integrity of others, he unfortunately, though with a capital more than sufficient to pay all his debts, became a bankrupt. The unhappy old man, in a moment of desperation from this unexpected stroke, attempted to destroy himself; and the wound, though not immediately mortal, hastened his death, which happened Feb. 9th, 1782, at seventy-eight years of age. 1 Manning and Bray’s Hist of Surrey. Gt-nt. Mag. 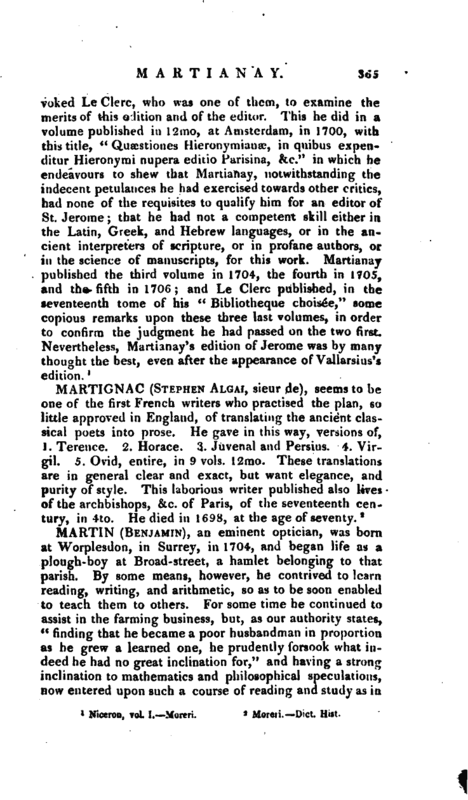 for 1785,where is a veryfine portrait of Mr. Martm. I’reseut State of the Republic of Letters, rci. XVI. p. 16-t. Huttou’s Dictionary.